Awesome vacuum. Just love the light weight of it. Would recommend to all. Clean your home with Dyson's latest compact upright. The Dyson Small Ball Multi Floor Vacuum combines the performance of a full-size vacuum in a machine that only weighs 12.15 pounds. With a combined cleaning reach of 42 feet, this vacuum is sure to get those difficult to clean spaces. The retractable handle save up to 50-percent more storage space and produces 30-percent less noise than the previous compact upright. Clean multiple areas of your house with the self-adjusting cleaner head that automatically seals in suction across carpets and hard floors. Ball™ technology steers easily into difficult to reach places. I suffer from Chronic back pain and this vacuum it’s perfect for me, because it’s lightweight, and it cleans the mess from my 3 dogs and 3 teenagers who by the way don’t mind vacuuming ever since I purchased this Dyson Small Ball Multi Floor Vacuum. For the most part this vacuum was not what I thought it would be, but it does work good. It cleans hard floors and carpet which is a plus. I wish it had an attachment hose you could use along the base walls. Honestly, I wish I had just bought another Sharp lift-away vacuum. This vacuum is fantastic! Great for a small apartment and works on multiple surfaces. It's also very lightweight and small so storing it is easy. This vacuum was worth the price! It works great for my small one bedroom apartment. It picks up everything. After each use I feel like the carpet is thoroughly cleaned. 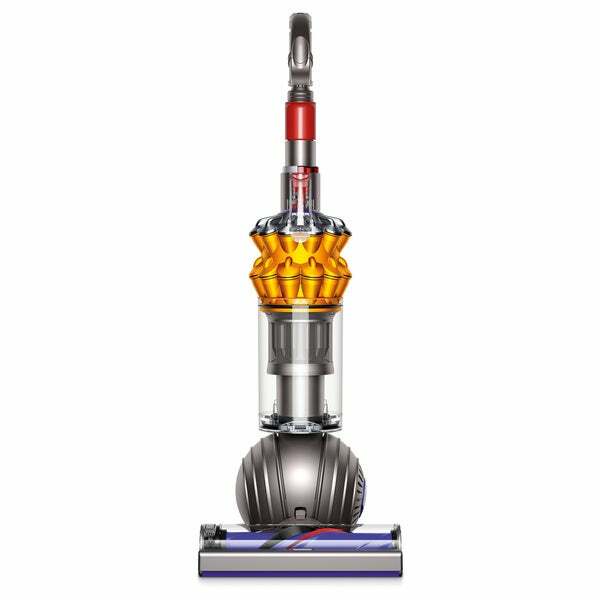 This is an amazing vacuum, it is powerful but light weight. There is ease of operation and It is relatively quiet. I would recommend it to anyone who is in the market for a great vacuum. I also like the color. Best vacuum I have ever owned very powerful but light weight. This is a great buy and it works great on hardwood and carpet. "Will it work on a vinyl floor"
Yes, this will work on vinyl floor. Our cleaning lady recommended this vacuum for our home.